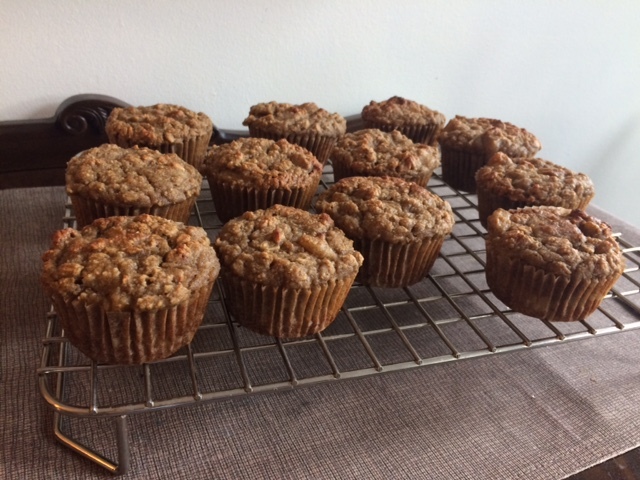 I love making muffins! They are so versatile and a healthy portable snack, perfect when you have kids! This recipe was given to me by a friend after I enjoyed some that she made. My favourite thing about these is the versatility, you can add all sorts of ingredients including veggies! They can be made so many ways! 1 tsp baking powder, 1 tsp baking soda, 1 cup oats, 1 cup flour (any type). Stir in 3/4 cup fruit or nuts of your choice – mix and spoon into greased muffin tins. These muffins are pretty forgiving so you can play with what you have on hand. Here are some examples. One avocado, 1/2 cup of shredded coconut, 1/4 cup semi sweet chocolate chips, pecans, strawberries. Instead of 4 bananas she used 2 bananas and 2 zucchinis. She added a little extra flour. Three bananas and one small zucchini. Instead of 3/4 cup fruit or nuts I added 1/2 cup shredded coconut and 1/2 cup sliced almonds and about 1/2 cup chocolate chips. I used 1 extra egg. Instead of 1 cup oats I added about 1/2 cup oats and 1/2 cup cocoa. Instead of fruit or nuts I used about 3/4 cup peanut butter (and mixed this into the wet ingredients). I also added a tsp of vanilla. In this version I used Bob’s gluten free flour. * I have a really powerful blender called a Vitamix, it’s so powerful that when I add veggies, you can’t see any evidence of them! I’ve even tossed in some leftover cooked broccoli. I can’t guarantee those results for all blenders.